Jelena cannot understand why her sister remains calm when their parents yell about her faith. Fourteen-year-old Jelena Dubljević tried to catch people’s attention with her appearance. She wore two or three earrings in each ear. She had two or three rings on every finger. She wore bracelets and a silver necklace with a peace symbol. She wore colorful makeup. She kept changing her hairstyle. Nobody could guess from her looks that she was searching for peace. Her 19-year-old sister, Ljiljana, began to prepare for baptism at New Belgrade Seventh-day Adventist Church. After every Bible study, she announced what she had learned at home. Mother didn’t stop fixing meat. Instead, she tried to camouflage the meat. She chopped up chicken into tiny pieces and mixed it with rice, tomatoes, peppers, and other vegetables. But Ljiljana saw the chicken and refused to eat. Mother screamed at her. That wasn’t all. When Ljiljana got dressed to go to church on communion Sabbath, Mother locked the door and guarded it so she couldn’t leave the house. But Ljiljana wasn’t deterred. She stopped eating meat. She kept the Sabbath. She gave tithe. Mother yelled a lot. Poor Jelena didn’t want to be in the same room as her sister and shouting Mother. She fled to her own room. But she saw that Ljiljanahad peace. Even though Mother yelled,Ljiljanaremained calm. She seemed confident that everything would be find. Jelena desperately wanted that peace. Pacing back and forth in her room as she could hear Mother yelling at her sister, she asked God to fill her heart with peace. “If You are really alive, give me peace in my heart,” she said. Suddenly, it happened. She felt peace. She decided to follow God no matter what Mother said. The two sisters started praying together under a blanket in Jelena’s room. They left the house to study the Bible together. Even when it rained, they stood under an umbrella and read the Bible on the street. After a while, Jelena declared that she wanted to be baptized. Mother was furious. “Until you are 18 and as long as you are living under our roof, you cannot be baptized,” she said. Jelena kept reading the Bible. She read about the sanctuary and the sacrificial system. Her heart was touched by Jesus’ great sacrifice for her by dying on the cross. It was hard for Jelena to change the way she dressed. She loved her earrings, rings, necklace, and makeup. She remembered that Jesus had given up everything in heaven to die for her. She prayed for help. Finally, she took a heart-shaped box and, weeping, placed all her jewelry and makeup inside. She felt like she was cutting off an arm. But after she slid the lid onto the box, she lost all desire to adorn her appearance again. Several months later, she was baptized. Ljiljana and Father came to the baptism, but Mother refused. Jelena prayed for Mother. She prayed for Mother every day for six years. One day, Mother asked for Bible studies, and then she was baptized. Part of the Thirteenth Sabbath Offering in second quarter 2020 will help New Belgrade Seventh-day Adventist Church move into its own church building. 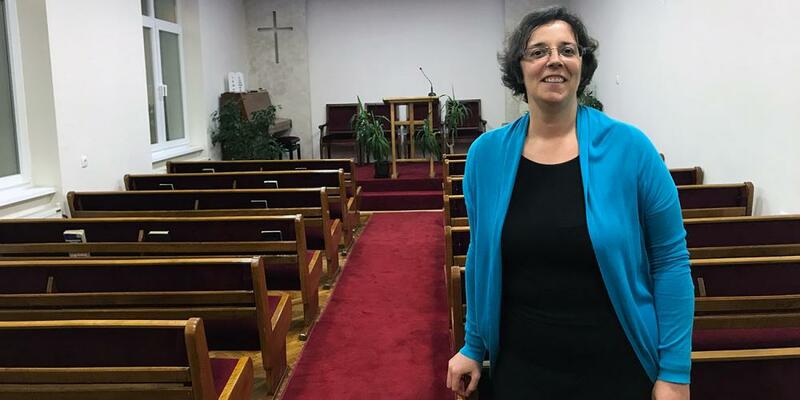 The congregation met in a rented movie theater when Jelena first started attending, and now it shares a building with another congregation in a town near New Belgrade. A Shirt to Talk About A Norwegian Adventist loves to puzzle strangers with his favorite green polo shirt.